A group of inspiring citizens was honoured on Dec. 5, in a ceremony in Ottawa in which the Honourable Jean-Yves Duclos, Minister of Families, Children and Social Development, handed out the 2017 Canada’s Volunteer Awards (CVA). A pair of McGill alumni, Valérie Toupin-Dubé and Lauren Rathmell, were among the recipients. 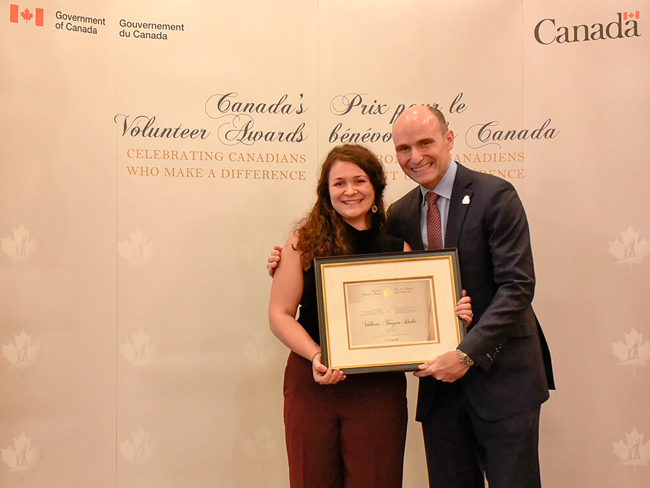 The Honourable Jean-Yves Duclos presents Valérie Toupin-Dubé with Canada’s Volunteer Award for Emerging Leader (Quebec). The CVA program recognizes the enormous contributions that volunteers, not-for-profit organizations and businesses across the country make to help people and their communities. The Awards highlight people working in partnerships to find new solutions to strengthen the country. While a student at McGill’s Macdonald Campus, Toupin-Dubé volunteered at the Macdonald Student-run Ecological Garden, an initiative that gives students experience in agricultural production while supplying sustainable fruits and vegetables to West-Island communities and McGill students. During that time, she also co-founded the McGill Global Food Security Club, the Out of the Garden Project Café, and the Farm-to-School Project, an initiative designed to teach young people about the advantages of local food and responsible procurement. Under the leadership of Toupin-Dubé, the Farm-to-School Project evolved from a student club to an independent nonprofit: École-O-Champ Québec/Farm to School Quebec. Today, the group works with over 20 schools and numerous farms across Quebec, offering educational summer camps and various outreach initiatives, in addition to programs that include agriculture, environment and nutrition literacy as part of the elementary and high school science and history curriculum. Toupin-Dubé is also the Executive Director of Corbeille de Pain, a charitable organization that supports West Island communities in Montreal with food security, to create more access towards community kitchens and nutrition seminar programs. “Through her involvement with Corbeille de Pain and collaboration with partners, [Toupin-Dubé] has provided hundreds of vulnerable individuals, including young families and refugees, a basic level of food security,” says the CVA citation. Biochemistry grad, Lauren Rathmell, accepted the CVA for Business Leader (Quebec) on behalf of Lufa Farms Inc., an enterprise she co-founded in 2011, as the world’s first commercial rooftop greenhouse on top of an office building in Montreal’s Ahuntsic borough. The burgeoning urban farming company, is based upon a simple concept: grow food where people live and grow it more sustainably. 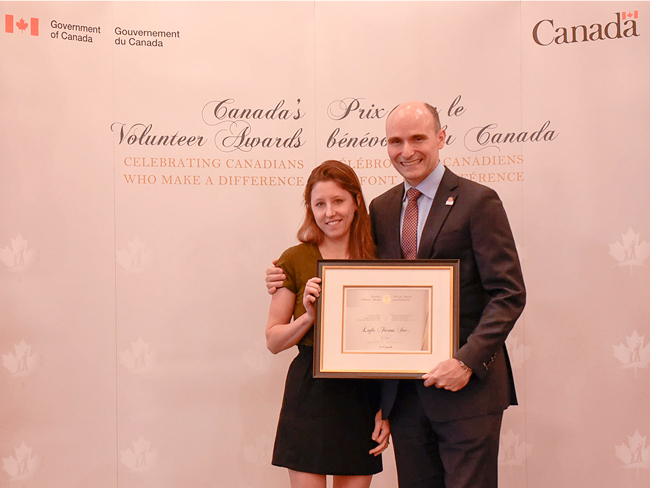 The Honourable Jean-Yves Duclos presents Lauren Rathmell, accepting on behalf of Lufa Farms Inc., with Canada’s Volunteer Award for Business Leader (Quebec). Produce is grown hydroponically through a system of plastic tubing that feeds them, recycles the water and reuses it; the circulation system and microclimate are managed by computer software. 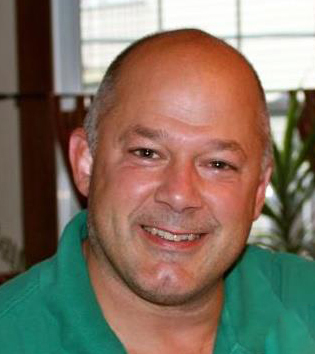 Rathmell is the greenhouse director, overseeing the farming, plant-science activities and marketing. Check out the 2017 Canada’s Volunteer Awards recipients who were recognized on Dec. 5.